The best way to produce a brilliant, protective shine and clarity to acrylic, polycarbonate and most other types of plastic surfaces. Ideal for protecting and preserving eisenglass enclosures on boats, as well as plexiglass or lexan windscreens, windows, tables and counter-tops. Also ideal for use on the car and around the house. Quickly and easily restores the shine and luster to virtually all plastic surfaces from headlamps to household appliances. Provides a durable finish that resists staining. 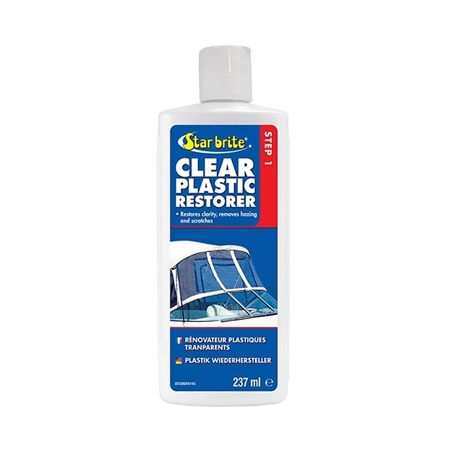 Use with Starbrite Plastic Scratch Remover as the two-step process to restore, new-looking plastic. Other products require three steps to restore plastic - Starbrite saves you time, money and effort by doing the job faster and better in just two steps!